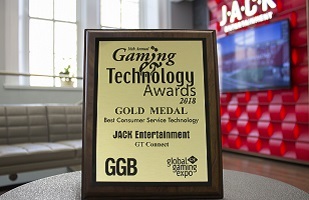 JACK Entertainment LLC is excited to announce that it won Best Consumer-Service Technology from the 17th Annual GGB Gaming & Technology Awards for its development of GT Connect. The company received the gold medal at the 2017 Global Gaming Expo in Las Vegas on October 5, marking the first time a casino operator has won this prestigious award. JACK Entertainment launched GT Connect along with its innovative mobile app in January at its portfolio property Greektown Casino-Hotel in Detroit in order to simplify and enhance the guest experience. The patent-pending GT Connect technology connects a virtual player’s card via a secure USB port installed in all slot machines. While connected, guests are able to earn rewards, download bonus play and securely charge their smartphones, using any USB cord. The mobile app features exclusive app-only promotions, comps and free play bonuses. The app also allows guests to request their vehicles from valet, redeem comps at restaurants, access offers on the go and more. The GGB Gaming & Technology Awards are the casino industry’s most prestigious awards for technology, products and services that enhance the gaming experience. The honors are designed to recognize and encourage innovation and technology in the rapidly changing casino industry.